Yarn Holders for Crocheting Add to Flipboard Magazine. Can You Find Good Yarn Holders for Crocheting? Yarn Holders for Crocheting sounds like an easy thing to find. But trust me, it’s not. 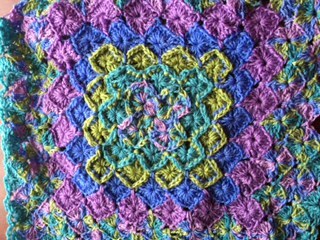 I am currently working on a crocheted afghan that has many colors, as you can see on the left. Don’t look at it too closely, I have messed up on the pattern, but I still like it. With all the different colors of yarn in my bag, along with crochet hooks, scissors and who know what else, it is a mess. When I reach in the bag to start crocheting, it takes me half an hour just to get the yarn untangled. There must be a better way to keep this yarn from tangling so badly in my bag. 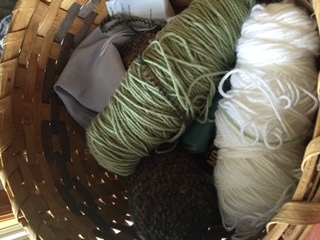 At home, I keep my yarn in a basket and it is no better. I still have a tangled mess. I have thought about this problem every time I get my yarn out to crochet. I have really tried to come up with the solution on my own, but as we can see, I haven’t found one. Being a DIY person, I figured others must have this problem too, so I went to Pinterest to see what they came up with. I found great solutions for Ready-Made yarn holders and DIY Yarn Tote Organizers. I am in love with these trolls! I know some may be offended by these adorable troll yarn holder, but they make me smile. I have a rule in my house, if it makes me smile, I need it. These would be perfect with yarn balls instead of skeins. Which is great because I use balls of yarn. These bowls will allow my yarn to move around and unwind without tangling up with other yarn colors. The trolls are completely custom made, wheel thrown, hand altered and sculpted. The best part about it, she makes them when you order them. So if you like the ones she has on display, tell her which on you want. But if you have an idea for one, tell her and she will do her best to make it for you. You get to decide if you want horns, teeth, tongue, tusks, buck teeth, sharp teeth, big or little eyes or a cyclops, eye lashes, happy face or sad. She is ready to completely custom make your very own troll. Do you want the yarn to come out of its mouth, nose, eye or teeth…..what about out their ears. These truly are a “One of a Kind” piece of art. How fun this will be to design! You can name it as well. Each troll comes with a birth certificate with its name on it. They will give it a name if you don’t have a name picked out. She named one Snotty Oliver and he went viral. So they give them really great names. Once you place your order, it takes about 8 to 10 weeks for you to get your new little troll. But it will be worth it. 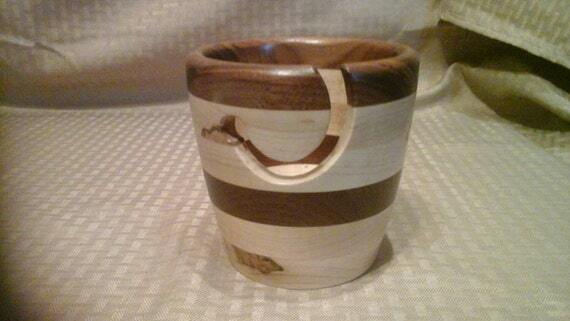 I love wood, I love the smell of wood, so wood is a natural choice for me in a yarn bowl. It really is a personal preference. Aren’t they pretty?!?! 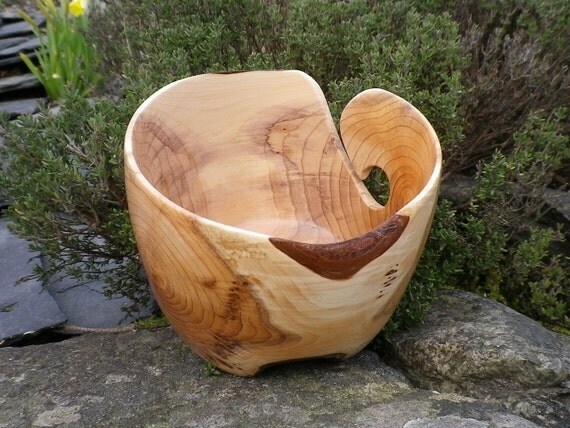 In reading about these, one of the craftsman says he hand turns these out of local yew wood that either has been blown down from the wind or fell for other reasons. So he isn’t harming our forests to give us a pretty yarn bowl made of wood. He also said he polishes his yarn bowls to a high finish with homemade bees wax polish from his own beehives. I think that is fantastic! These aren’t just another wooden bowl, they are a work of art that someone has lovingly made with their own hands. I can’t decide between the yarn bowls made of wood and the trolls. I think I am leaning towards the trolls. 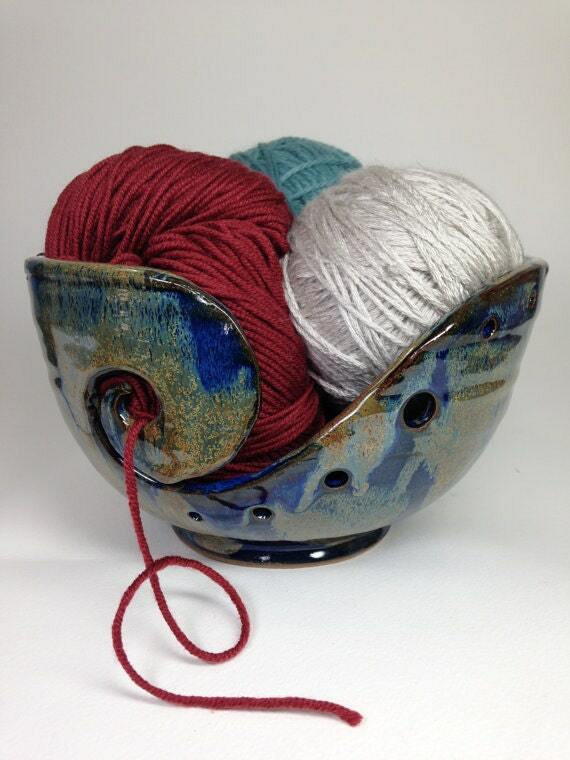 Pretty yarn bowls made of pottery are both useful and look good. 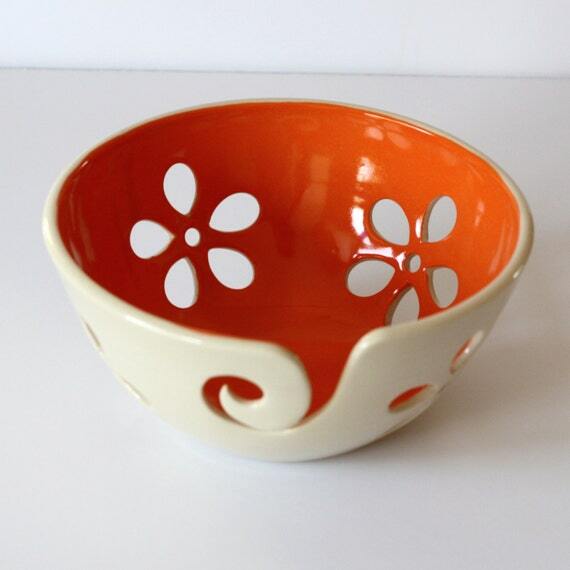 You can keep this sitting on a table and people would think it was just a pretty pottery bowl. These are all special order, so you get to choose the color and shape and size. They will work with your ideas and make them come alive for you. 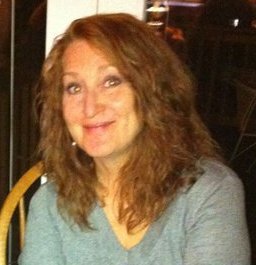 The BlueRoomPottery shop owner is a crocheter, so she had the same problems we have and found a great solution. Only thing is, she made them prettier. The first yarn bowl is hers. 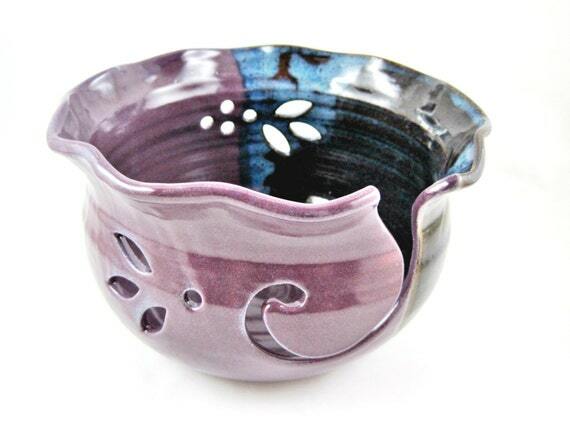 I love the twisted leaf on the first yarn bowl. 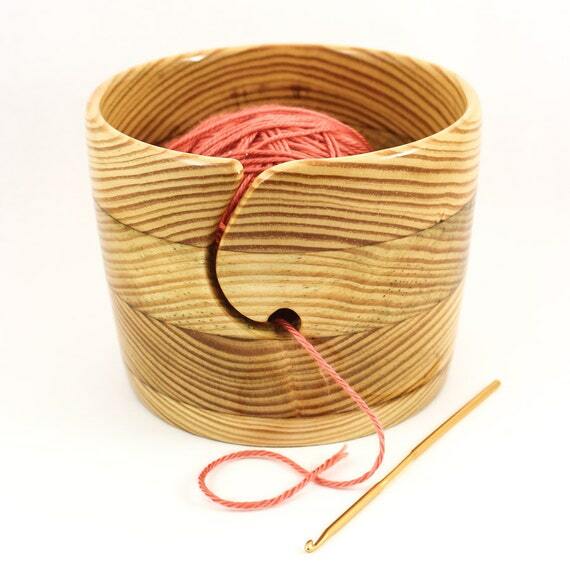 You could use these bowls for anything in your home, not just to hold yarn. They are so pretty and would look great in every room. 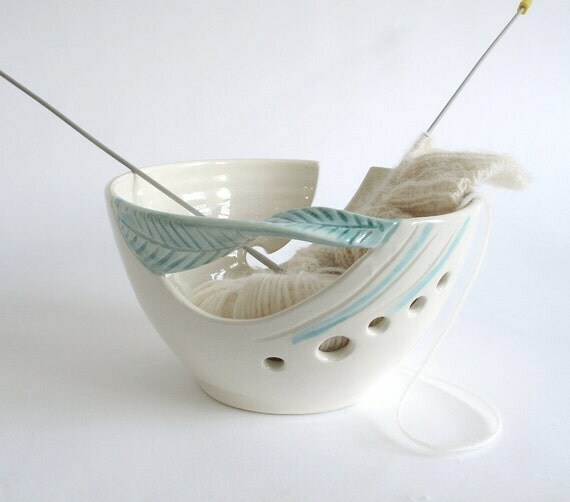 RehnWorks from Etsy, she made the variegated blue yarn bowl, she uses traditional Korean style when she makes her pottery. I have never heard of it, so I looked on YouTube. I found this amazing video showing them doing Korean style pottery. I wish I was that creative to do something like that. I am not sure how this differs from tradition pottery making, but wow…..it was very beautiful to watch. Take a look! Something as simple as a baby wipe dispenser could really work well. I can never find the end of the yarn that they have tucked inside, so I always end up winding mine up into a ball. 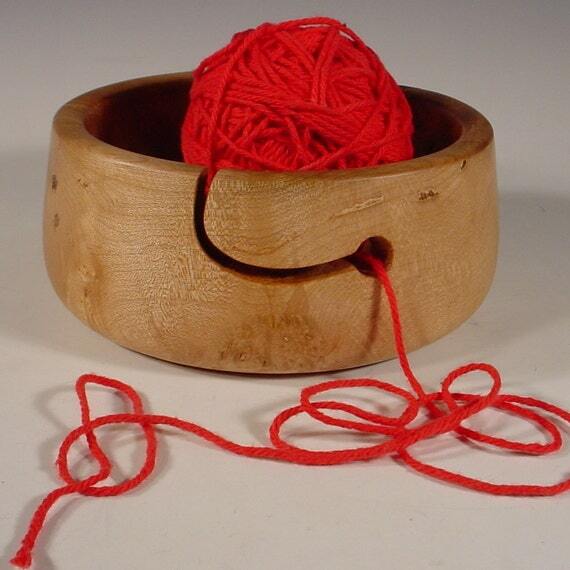 As long as the ball of yard isn’t too big, this would be a really great yarn holder for crocheting. Since I only work with one ball of yarn at a time, this would be great. This idea comes from Real Simple Magazine. Once again, if you can find the hidden end inside the yarn skein, this is a great idea. So I don’t think this idea would work for balls of yarn unless the plastic container was a bit taller. 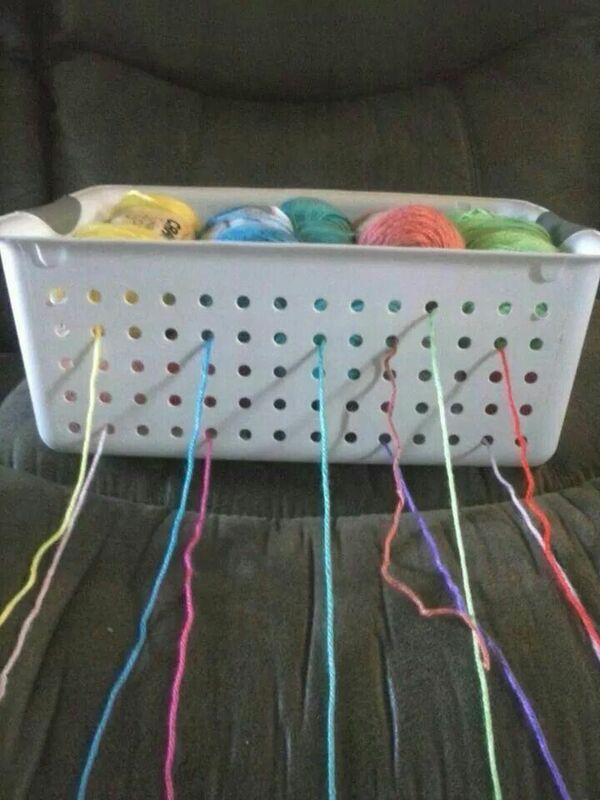 I love this idea because you can store your yarn in these plastic containers as you are working on your project. They will stack easy too. So for the project I am doing now, I could have 2 of these containers with 2 skeins of yarn in each. That would be so nice. I don’t leave my crocheting projects or yarn sitting out, I always put them back on the closet shelf. She gives full instructions on how she did it, especially the grommets. They will keep the sharp cut plastic from cutting the yarn. This girl was thinking! This idea comes from Chatter Box Jenn. This was on Pinterest, but it didn’t link to any web site. I think it is self explanatory. If this had a lid, it would be perfect for travel. You can get several skeins of yarn in there at one time. This is a great idea! This was so simple the whole time. I should have looked for this answer years ago. Enjoy the video….I sure did.